Spiced John Dory is a Portuguese food recipe for fish baked with tomatoes and bok choy. Season the John Dory with the spices mixed together. Cut a tomato into four pieces and take out the seeds. 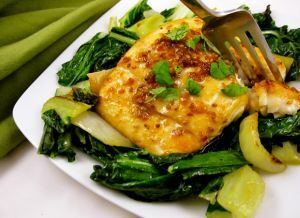 Mix the tomato and bok choy together and place them between the fillets of John Dory. Cook in the oven with a little olive oil. Cut the white bread into small squares, mix it with the coriander and then mix with the boiling fish stock to thicken. Roast the chicory in the oven and serve with the old mustard sauce.